The OXO Good Grips Mixing Bowl comes in three convenient sizes. 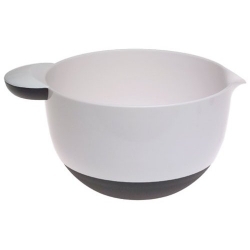 The 3-quart bowl is convenient for mixing batter, dough, marinades and more.. The Mixing Bowl features a non-slip wrap-around base that prevents skidding, even when the bowl is tilted. A comfortable, non-slip handle gives you a firm grasp for easy whisking and stirring. The wide lip and spout makes pouring neat and clean. OXO Good Grips Bowls are dishwasher safe. Also available in 5-quart and 1.5-quart size.